These cadaver drawings were done by Charles Landseer, most likely done under the instruction of Haydon, when Landseer was between 14 and 16. 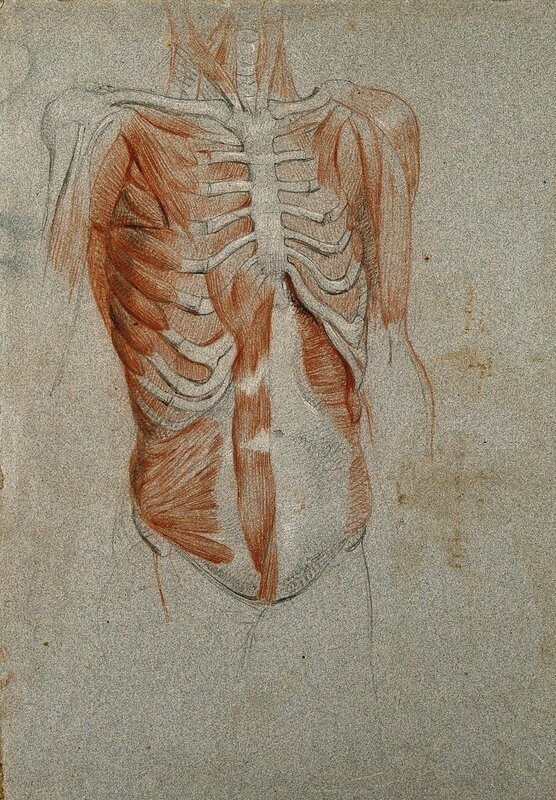 "This is one of a set of superb anatomical drawings, mostly in red chalk, that emerged from a course of instruction in anatomical drawing held around 1813-1815. The driving force was the controversial painter Benjamin Robert Haydon (1786-1846). Haydon thought British artists should emulate Raphael and Michelangelo and produce paintings of important events in history and religion, not just portraits of landowners and pictures of their race horses, etc. As Raphael and Michelangelo had studied anatomy to give lifelikeness to the heroes in their pictures, so Haydon set up classes outside the Royal Academy Schools, and in competition with them, to enable art students to emulate Raphael and Michelangelo in the study of anatomy. He recruited his friend the anatomist Charles Bell to be the professor, and the talented teenage sons of the engraver John Landseer to be the students. The Landseers were willing members of the class because their father was in dispute with the Royal Academy over its refusal to admit engravers to the rank of Royal Academician. 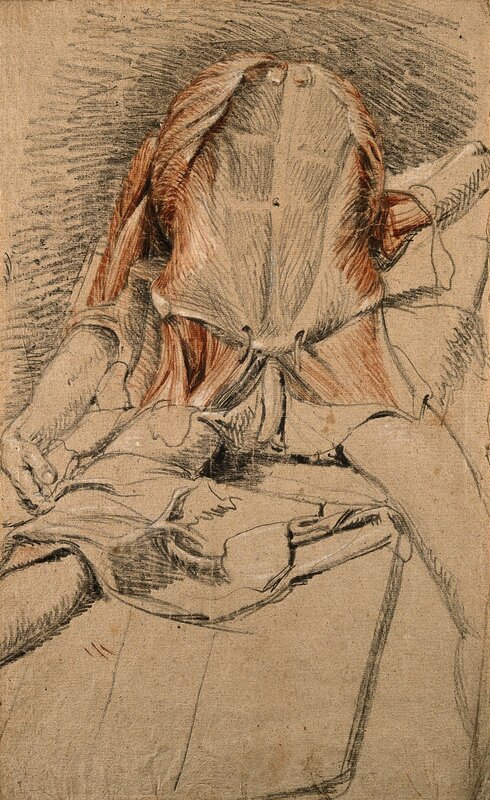 Bell performed some spectacular dissections, Haydon showed the Landseers how to draw them, and the teenage boys executed many drawings such as this one, using Haydon's drawings as their model. 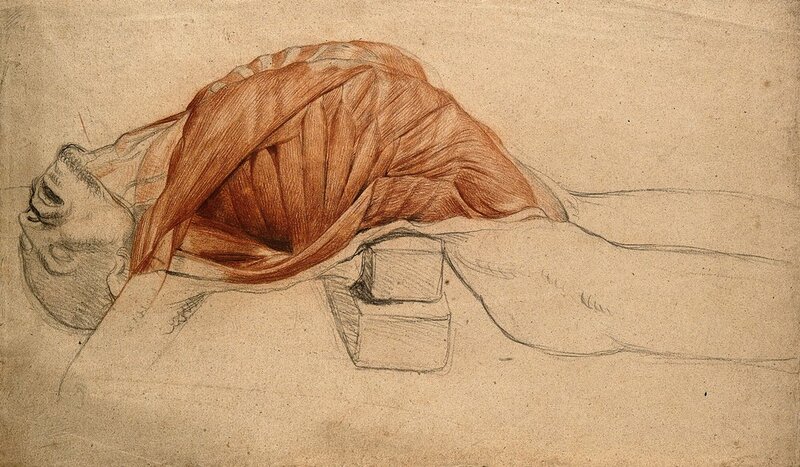 By a twist of fate, Charles Landseer, the author of this drawing, later himself became the keeper of the Royal Academy Schools, and Haydon's own anatomical drawings are kept today in the Royal Academy's drawings collection." The Wellcome Collection website can be found here.